Public health bodies in many countries – as well as international bodies like the World Health Organisation – are urging us all to adopt a better diet for improved health and reduced environmental impact. The key priorities are to reduce our consumption of red and processed meat, other high saturated fat animal products and foods high in fat, sugars and / or salt and to increase intakes of plant foods and fibre. Plant-based eating places foods such as plant proteins including soya, beans, nuts and seeds as well as more fruit, vegetables, whole grain starches and vegetable oils at the core of the diet. The nutritional characteristics of this way of eating (low in saturated fats and energy density whilst being high in unsaturated fatty acids and fibre) is thought to support healthy hearts, body weight and blood sugar levels. All of this means that following a balanced diet with more plant-based foods points to a longer life in good health. The latest UK government dietary guidelines, the Eatwell guide, came with significant changes and a clear message that our intake of meat and high saturated fat animal products needs to be reduced whilst healthful plant foods should make up over ¾ of our daily intake (food weight). This is in line with international health organisations’ recommendations and other national dietary guidelines which are based on nutrition, health and environmental security. Change in focus for our national dietary recommendations: For the first time, the government has incorporated the environmental as well as the health impact of our food choices, and the final guidelines have a clear focus on more healthful plant foods whilst removing foods high in (saturated) fat, salt and / or sugars altogether. Why environmental considerations for our food choices can no longer be ignored: Despite current food production being adequate to meet the needs of the 7 billion global population, 2 billion exceed their needs whilst 800 million suffer hunger. Irrespective of over or under consumption, micronutrient deficiency is rife across all population groups. · Contributes 20-30% of greenhouse gas emissions. · Is the leading cause of deforestation and biodiversity loss. · Pollutes soils and water. · Accounts for 70% of all human water use. · 30–50% of all food produced is spoiled or wasted – representing a waste of land, water and other inputs, ‘unnecessary’ emissions, and contributing to food insecurity. The new plant-powered Eatwell guide has the potential to reduce our environmental food print by almost a third (32%) and help Britain meet the UK’s 2050 climate change government targets. Micronutrient concerns have been raised if the population moves towards a plant-based eating pattern. However, concerns often stem from the misunderstanding of the term ‘plant-based eating’ which does not necessarily mean the exclusion of meat and dairy. 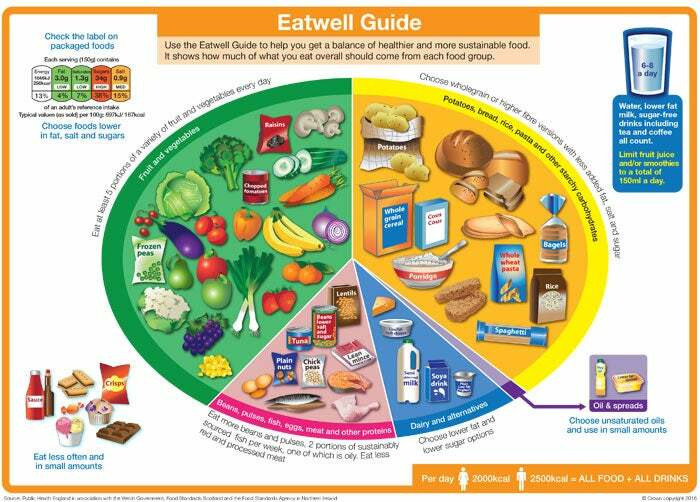 The Eatwell guide, is a plant-based eating pattern which has been specifically modelled to ensure that the new fibre and all micronutrients dietary recommendations are achieved whilst energy, macronutrient and salt intakes do not exceed requirements. · Eat more plant protein foods e.g. soya, beans, pulses, nuts and seeds. · Reduce meat intake, especially red meat to no more than 70g (cooked weight) per person per day. · Avoid processed meat and meat products. · Achieve 5-a-day for fruit and vegetables. · Consume starchy foods at each meal and choose whole grains wherever possible. · Consume dairy and calcium fortified alternatives in moderation. · Opt for vegetable oils and spreads in place of animal fats. · Avoid all food and drinks high in fats (saturated), salt and / or sugars. · Drink 6-8 glasses of fluid daily: water, low fat dairy milk or calcium-fortified alternatives, sugar free drinks and unsweetened tea and coffee. Women should consume no more than 2,000kcal per day and men no more than 2,500kcal per day. For more information and full references click here.